Our ATR turboprop plane with only 15 people on board, backpackers most with a strong nasally slurring Australian accent, touched down on the small airstrip. 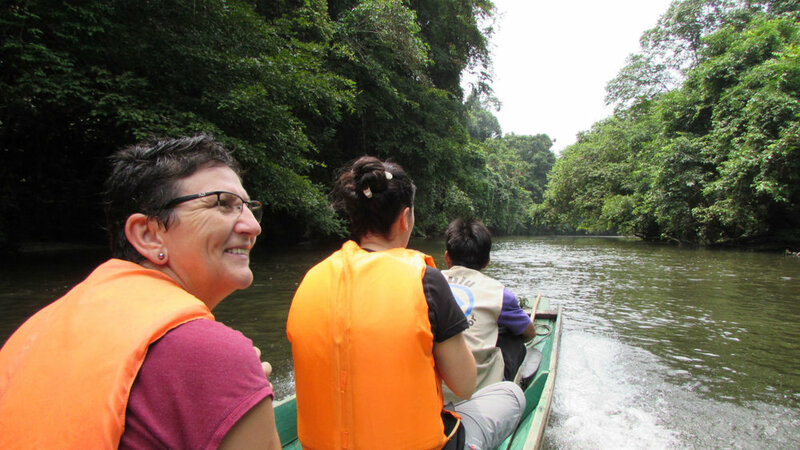 We had flown 1.5 hours across the interior of Northern Borneo and down below saw the immensity of the rainforest. From 25000 feet it looked like an enormous broccoli only cut by hundreds of muddy brown coloured twisting and turning rivers and the occasion clearing where loggers made fortunes harvesting precious tropical wood. The airport at the Gunung Mulu National Park was a mere cafeteria with a veranda and the only tarred road (not connected to anything) was four kilometers long connecting the airport with the Parks headquarters and the Marriot Resort which we called home for the next six days. 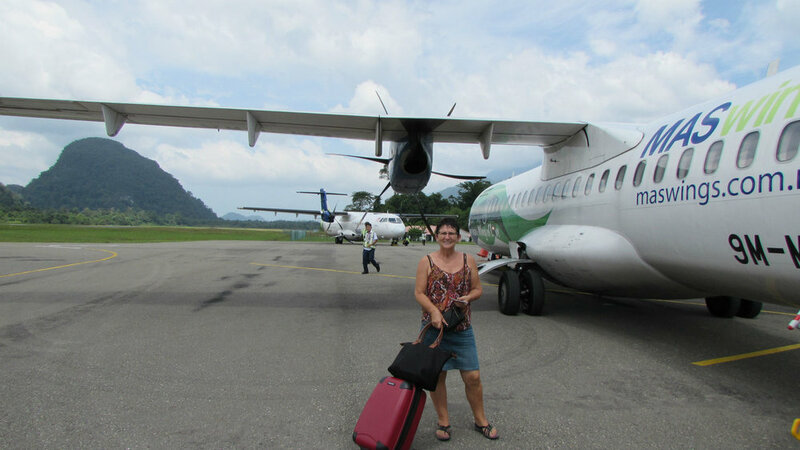 Apart from the airplane, the only other connection with the outside world was a 12 hour ride on a longboat to the coastal town of Miri! Every morning Francien and I hiked on rain spattered paths, up and down slippery leaf strewn slopes thick with vegetation, sometimes balancing our way on tree roots, climbing over fallen tree trunks. In this equatorial forest there is a permanent greenish twilight as the canopy filters out the tropical sunshine. Huge dipterocarp trees, strangler fig-trees (actually strangling other trees and killing them), trees with intertwined stilted roots. Liana type vines clad the 40 meter high evergreens. We stopped at a waterfall for a most welcome refreshing dip in the water. The forest creates its own rain-system, meaning with temperatures constantly around 32 C, the humidity was always 99%. At first we were soaked with perspiration, then when the torrential afternoon rains came, soaked to bone with rainwater: it did not matter to us anymore. In the jungle it was eerily quiet and we did not see any wildlife. Occasionally we could hear a small bird chirp or in the far distance long-tailed macaques monkeys rustling the tree branches. Clearwater Cave - watch the bats! Deer Cave, Clearwater Cave, Wind Cave: stalagmites, stalagtites, underground rivers, bats, spiders, cave-snakes, fungi and plants only known to be living inside these caves made for a surreal environment. The ammonia smell from the bats was stinging and we headed back to the outside just before the sun set. At dusk we then watched three million bats leave the caves as long spiralling ribbons in the sky, hunting for insects during the night. At night the jungle came alive and during a night walk we heard the loud high pitched shrill of the cicadas (kind of cricket) and tree-frogs. We saw a 10 cm long scorpion, a green viper hanging on a branch, huntsman-spiders, a spider carrying its own nest of young, snails and fireflies. The deep darkness of the nightly jungle made us even feel more vulnerable and tiny and now our most precious equipment we carried were small headlamps without we would not find our way back home! Although hiking in this muggy weather at times was strenuous, the jungle did have a very relaxing effect on us. Somehow these forests seem timeless, untouched by humans (as much as possible nowadays), hostile places for people like us spoiled with modern time comforts! These jungles and the caves within for us were awe-inspiring, not readily to be forgotten.